I love painting pumpkins and have developed a recent addition to glitter paint. You had to know where this was going. Armed with a paintbrush and a bottle of Martha Stewart Craft Glitter paint in Sterling, I went to town on a few small, white gourds from the local farmer’s market. Using the “Dipped” Diagonal technique I showcased in this Painted Pumpkins post, I wrapped the pumpkins each once around with blue painter’s tape, then coated the bottom of each pumpkin with paint. The first two layers were coated with metallic silver acrylic paint to provide a solid base for the glitter, then I slathered on a few more coats of Martha’s paint. 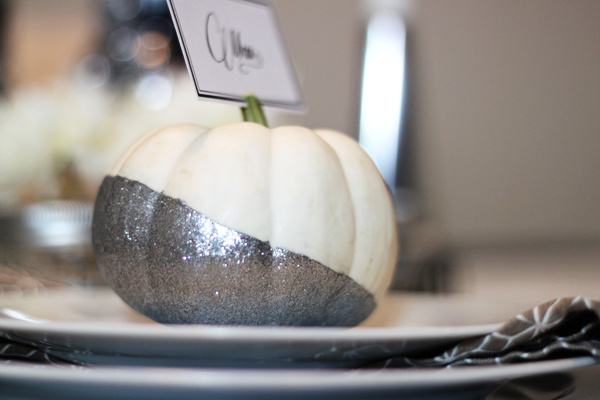 The result is a half-disco-ball-half-pumpkin that looks right at home on a glam-o-ween table. You can stop there and use your fabulous pumpkins on your mantle or centerpiece, if you’d like, but I had plans to turn these glittered mini-pumpkins into Halloween dinner place cards. 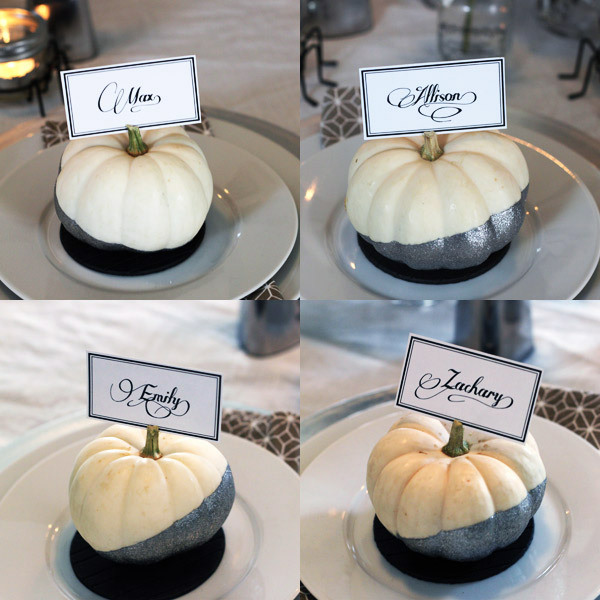 All you need to turn mini-pumpkins into place cards is a craft knife or box cutter. Use the box cutter to make a small, thin cut down the top of the pumpkin’s stem. Then, slide a place card or small menu into the slit so it stays in place. Easy, right? And so great and glittery. I do have a word of warning, though: As the great comedian Demitri Martin warns: “Glitter is the herpes of craft supplies.” If it gets anywhere, it’s gonna stay there forever. 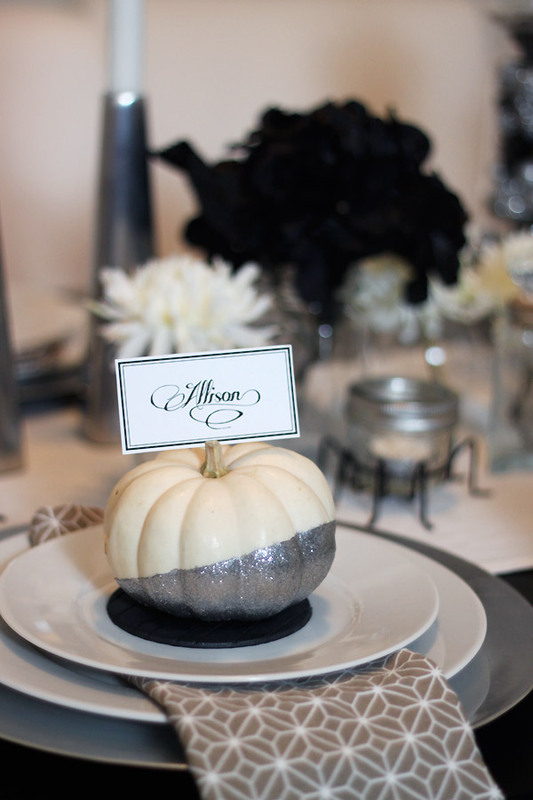 To protect your plates and guard your guests from ingesting glitter with their dinner, use small drink coasters as a base for your painted pumpkins. I used these inexpensive PANNA coasters from IKEA, which are $1.99 for a pack of six and come in five different colors. Beautiful!! I wish I would have come across this a week ago, before we had out Thanksgiving! Love the idea! Could you use fake pumpkins instead? I’m having a sweet 16 (Cinderella theme) party for my daughter in Hawaii (she wanted a trip not a formal party). 20 of us are going so I’m having a dinner there and shipping my centerpieces. I obviously can’t ship real pumpkins and I wouldn’t want them to be squished in the process! Where did you find the napkins? Love the placecards. Did you make your own? If so, what font is this? Pingback:	Decora con calabazas: ¡36 ideas realmente creativas!